Yesterday was going to be a very productive day. I was ready, set to work and my list foretold the perfect balance of actual work (business), writing, reading, exercise and house stuff. I was in that ‘ready to conquer the world’ mood, and yet what I did accomplish, I’m like, “That was a day?” I’m referring to how long what I did took – how was it an entire eight hours? And also the fact that that is how little time it took, because I half expected to come out of the experience, old and withered. My husband left for work, I did a little reading, a little editing, a little exercising and then started my big goal for the day: organizing our spice cabinet. It was a surprise for my husband, Roy, but there is a story there. You see, both Roy and I like to cook and bake, so we have a lot of spices in our cabinet, but I keep getting frustrated because the cabinet is a complete mess. I mean everything is just thrown in there, and because we have so much, we can easily lose track of what we have and what we don’t, so we end up buying things we don’t need. But that is only part of it… I’m short, so standing on tiptoes trying to dig in a high cabinet usually ends with a lot of things falling out of the cabinet. I have asked my husband to take care of it, because a lot of the spices in there are things only he uses, so I wouldn’t know how to categorize them. I have asked him, told him it would be a great birthday gift, told him it needs to happen and whenever something would fall on me, would turn to him and say, “If only this cabinet was organized in some way, Roy.” So my husband, being oh so cute, starting doing the same thing to me whenever he was looking for something in the cabinet. But I’ve been the main cook in the kitchen lately and with Roy’s hours that is unlikely to change anytime soon, so I knew I would be going crazy if I didn’t do something soon. Besides, it made sense because I’m the one who is great at organizing and I get a little warm tickle when I am working some organization magic – I’m weird like that. 😉 I figured that it would take me about ninety minutes, but my problem is when I get an idea in my head, it quickly becomes a much bigger idea, in this case my mind wandered to our pantry. 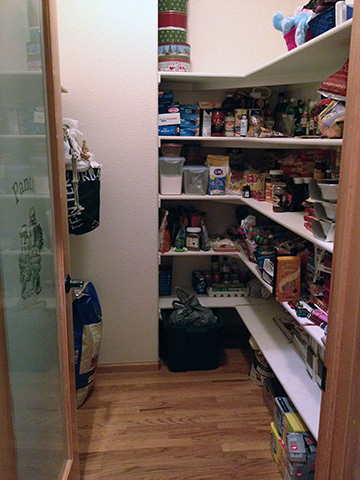 I love our pantry, it is a large walk-in (6×8 feet) with six built-in L-shape shelves along one side and the back of the pantry and then a high shelf with hooks to hang things on the opposite side. Our pantry was one of the many things I fell in love with before our house was officially ours. But since we moved in on September 30, 2011, it has not actually been cleaned out. I mean we go through things and throw them out, nothing perishable is in there and no produce so it isn’t like anything is rotted, spoiled or moldy, and perhaps that is why we have been so lax. I knew that among the many bags thrown on one of the shelves contained things I might want to put in our spice cabinet, so it made sense to tackle that too, and logically I should tackle that first. I thought it might take an additional two hours, but I knew how surprised my husband would be, because it was really a mess, and yet it wasn’t a gripe. I got to work, and quickly realized that my two hour estimation was a pipe dream. Like our cabinet, there was no system in our pantry. 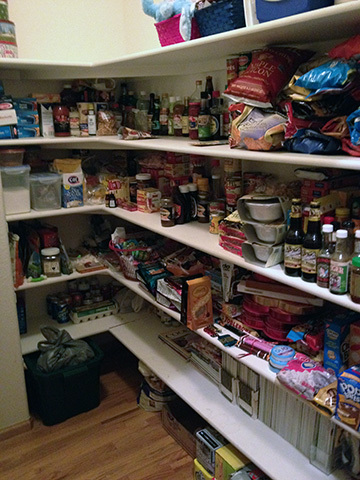 When we first moved in I had developed a system of what went where, but three years later of too many additions and not enough subtractions meant that the system the pantry began with was long gone. I mean there wasn’t even the faintest indication it had ever existed. Everything was everywhere and nothing was together like it should be. We might have three bottles of ketchup and each one would be in an entirely different place. So, I started there. I don’t know how I come up with organizational systems sometimes, it just works with very little conscious thought and I go with it. Like writing, that is when the magic happens. I started from the front of the pantry on every shelf and worked my way back, organizing everything in that order. Of course, first I had to take a lot out of the pantry to be able to get a sense of what would work where and what wouldn’t. But once I got into a rhythm time went by fast enough, almost too fast. Before I knew it three hours had gone by and I still hadn’t dealt with the two large pantry excavations I made earlier. 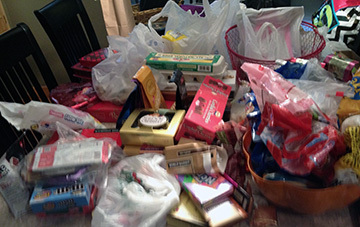 The first was candy and chocolate, which overtook our entire dining room table. I love sweets, especially chocolate, and I have never seen that to be a problem, but this… I felt like we should be on some kind of hoarding show. When I was nearly finished organizing and emptying the pantry, I found more candy stashed away and actually swore: “More candy? Dammit!” Then I paused as I set my newest finds on the dining room table, “Whoa, that’s something I never thought I would say.” And right then, loads of candy fell off the table on the side of where I was standing. It was like the universe telling me I had a serious problem. For the first time, my sweet tooth actually seemed like an actual issue. 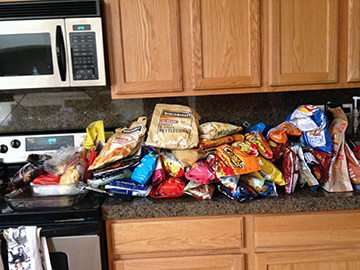 The chips situation was almost as bad, but at least that blame I share equally with my husband. We are out and see something we want to try, or buy a bag of chips we like because we think we’re out when we’re not, or… or… you get the picture. It took over the entire length of one of our kitchen counters (about six feet long). Most of the bags were practically empty so I consolidated and threw other stuff out completely. The entire time, I kept thinking that while I thought it was bad, I didn’t realize just how bad it was. Six hours later, and the pantry was finished. I was so proud of my accomplishment and determined that it would never get so out of hand again. Then it was back to the spice cabinet. It took a little over an hour, but felt like nothing compared to the pantry. 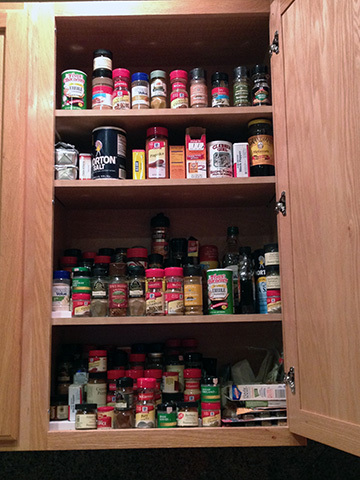 I made it simple; I put all of the duplicate spices on the top two shelves that are hard to reach. The bottom shelf had all of the things we use the most in alphabetical order, and second shelf had all of the things we don’t use as much, things usually for specialty recipes, baking recipes or special spices, etc. I don’t know how this rates on the practical side of things, but I didn’t know how else to organize it, and Roy was on his way home. There wasn’t time to deliberate and overanalyze other alternatives. He tried to be funny and asked about white pepper, to which I immediately replied, “W” and showed him where it was (we have to many kinds of pepper and other variants of spices this seemed like the best way to do it). This entry was posted in Family, home, Personal and tagged "house project", "spice cabinet", "sweet tooth", cleaning, hoarding, kitchen, life, love, organization, organizing, pantry, relationships, surprise. Bookmark the permalink.